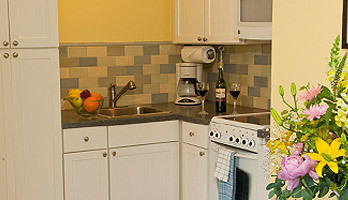 This cozy studio unit is located on the ground floor of our Sea Sprite at Haystack Rock Hotel. Drift to sleep with the sound of waves crashing on the shore. This partial ocean view room has a full kitchen and a large south facing bay window. Sit with a glass of wine and enjoy the solitude. This unit also features a private patio where you can enjoy our beautifully landscaped grounds. Perfect for an individual or a couple, the Sand Castle Studio features a queen-size bed. Sleeps 2 people. This room has a south facing partial ocean view. 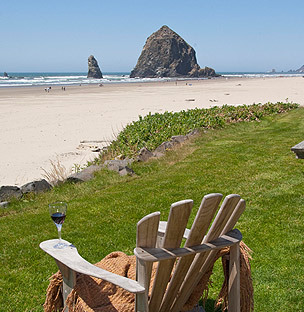 Our quiet location south of Haystack Rock provides a peaceful retreat for those looking for a place to replenish and renew.